Piave is an Italian cow’s milk cheese, made in Veneto. It has a hard exterior and a nutty, dense, full-bodied flavor. When serving, use a vegetable peeler to shave thin slices away from the rind. Foodie Note: Using a sharp knife, you can cut the hard rind away from the cheese and add it into soups or braises. Be careful not to use the label side of the rind. Heat olive oil in a cast iron pan to medium. 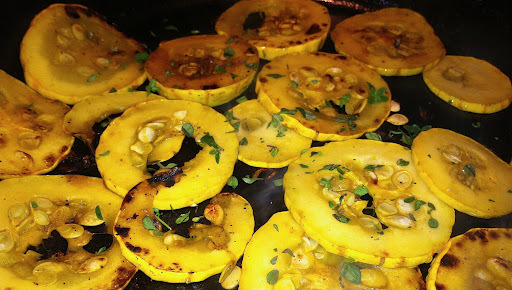 Add squash, coating in olive oil. Season with salt/pepper and let brown, about 3-5 minutes. Begin adding vegetable stock by the spoonful, pouring over squash so it begins to steam. 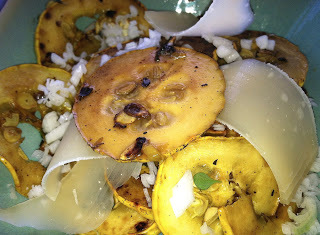 Scrape bits from pan and continue to cook until squash rind is soft, about 8 minutes. Add thyme, saute another 2 minutes, remove from pan and plate. Top with fresh leek and a few thyme leaves. Using a vegetable peeler, slice 6 long strands of cheese, layering into warm squash. Serve immediately.